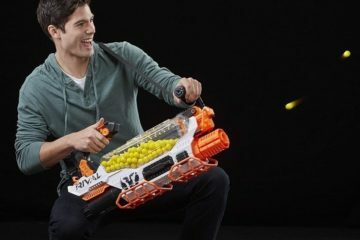 If NERF blasters are a regular part of your play schedule, there’s a good chance you have a ton of foam darts, magazines, and various accessories just lying around the house. Sure, you can keep them in any drawer, shelf, or random box in the room, but we imagine NERF’s Over-the-Door Storage will make a much better fit. A hanging storage, it gives you a selection of pockets and straps, allowing you to stash your foam blaster paraphernalia in a neat and organized manner. 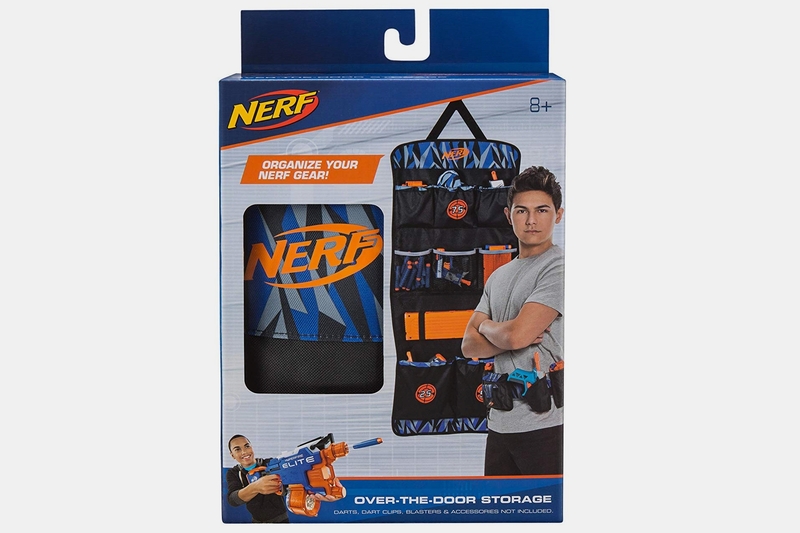 Just hang it in your bedroom door, a closet door, or wherever else the darn thing can go (preferably, away from sight of any girls that come over) to give yourself a place to hold all the NERF accessories you’ve accumulated through the years. 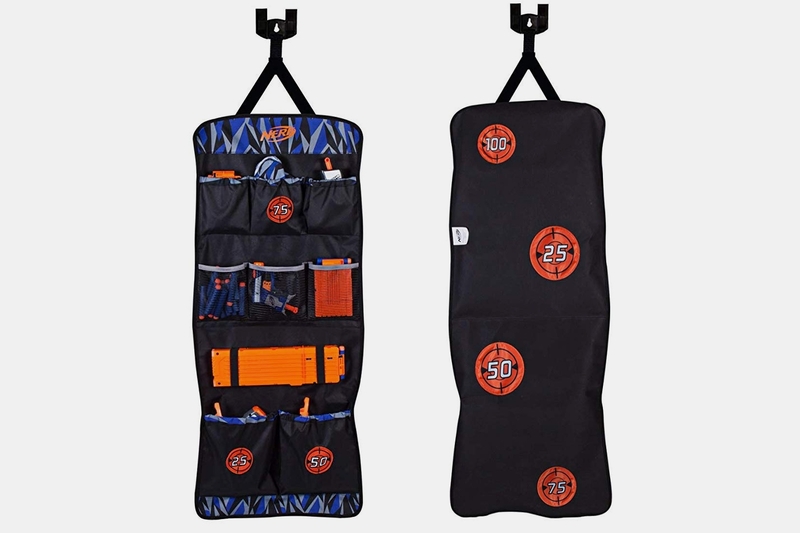 The NERF Over-the-Door Storage has three small expandable pockets on top sized to hold foam ammo, magazines, and accessories (think scopes, barrels, and stocks), as well as smaller blasters if you don’t have any other room for them. Underneath is a row of three mesh pockets that allow you to easily see what’s inside, while below that sits a pair of elastic straps that you can use to hold down a bigger blaster. Two large pockets at the bottom can be used to hold bigger accessories like drum clips, bipods, and masks, as well as some of the mid-sized foam blasters you’ve got in your collection. Marked targets on both the front and back (three and four targets, respectively) of the fabric give you items to shoot at if you need a bit of practice, with all targets compatible with the outfit’s self-stick darts, so you can clearly see how well your aim is doing . It uses a plastic door hook to secure itself to any door, whether closed or open, while a D-loop strap attached to that hook makes it possible to hang it on a wall hook if you’d rather use your door for your boxing or suspension trainer workouts instead. 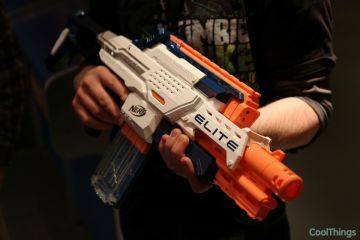 Of course, the NERF Over-the-Door Storage can be used to stash items that have nothing to do with foam blasters, from LEGOs and action figures to electronic parts and a whole bunch of other small items. Heck, you can probably hang it in the closet, then use it to store undies, scarves, and other similarly small garments, as well as in the workshop to hold tools, fasteners, and other supplies that would otherwise be scattered all over. Do note, this comes in a design that looks appropriate for younger individuals, so while it should make great storage for a school-age kid’s bedroom, it will totally look terrible in a grown man’s abode. Yes, even if you’ve spent the last decade and a half being the biggest Nerf geek among all of your foam-battling friends. You can, however, easily get away with hiding it in the closet, away from sight of anyone that may judge your foam warfare obsession, so it should all work out fine. The NERF Over-the-Door Storage is available now. 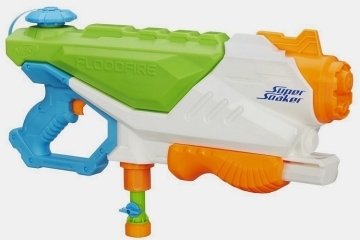 We have tons of nurf guns that gets shot all over the house all willy nilly. It would be nice if the kids would use something like the NERF Over-the-Door Storage as a target but I doubt it. Our kids don’t even use the targets we made for them. 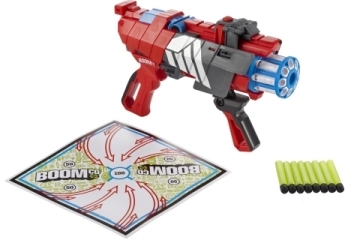 The best target for a Nerf gun is shooting another person lol. 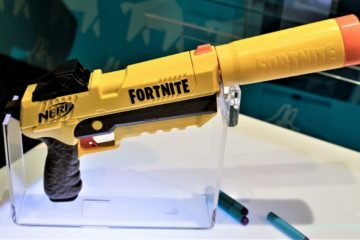 If our kids don’t pick up the Nerf guns or their other toys we put the in the basement and lock them up. When all of the kids’ favorite toys start disappearing and they wonder why we tell them. Initially, it was a pain for them, but now they are great about keeping their toys picked up. The targets on the NERF Over-the-Door Storage are not a selling feature for me. They are simple and too boring to shoot at. The selling point for me with the NERF Over-the-Door Storage is ease of use and style. It looks great in a kids room and is easy to use. I just checked Amazon and it is sold out. 🙁 The NERF Over-the-Door Storage is something most kids need so they don’t accidentally break their nerf guns. The guns are pretty durable for outdoor play, but if you leave one on the ground it is bound to get stepped on, and that will break it. Looks like you can make your own with a toiletries holder and some stickers. I mean you could, but would kids think it’s cool? Probably not. I’m sure an adult wouldn’t mind, but what adult who still plays would want to keep their stash out in the open like that? None that I know that’s for sure. If you are handy with crafts like my wife then that would be an option. She is good with sewing and crafty stuff, but I definitely am not. It would be much easier for me to just buy the NERF gun holder. If I was in charge of making one I would just give them a cardboard box like my parents did with me for my toys. I actually want to get one of these for my nephew. I’m wondering how long the sting is that holds it on the door. Right now he has a basketball hoop and I know that’ll never come down (and rightfully so) but I would like to know if they can both coexist before buying. 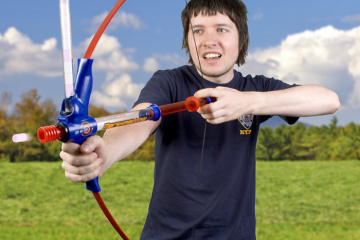 I’d probably place the nerf gun holder on a different door than the basketball hoop, even if it is not in his bedroom. I am sure if you did want to place it on the same door you could modify it to make the string tie that goes over the door longer. Do you own a sewing machine? I just read that the Holiday sales for Nerf in 2018 were a lot lower than normal because of Toys R Us closing up. Not that it will matter n the long-run, because NERF continues to sell a lot and continue to make new branded NERF products.NERF can afford to throw out products like the storage bag here, and then if they are successful they will keep making them and if not they have a drawing board with many other ideas they can easily manufacture.